When building a cozy room that the whole family will enjoy, its important that your furniture be both comfortable and versatile. This spacious sectional sofa is all that and more with its dual recliners, chaise lounge, full sleeper mattress, and drink holder console. This sectional sofa is easily able to seat five people, so everyone can enjoy the exceptional support of our stress-relieving comfort cradle seat cushions. The sleeper mattress is fitted with our specially-engineered iRest support system, a dense foam and gel-filled mattress that eliminates the excess heat usually associated with foam mattresses. 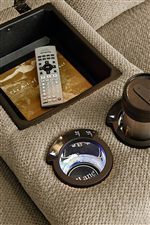 This incredible piece will make a great addition to all manner of living room and home theater set-ups. 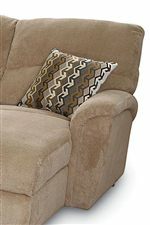 Sectional also available with power reclining seats . The Grand Torino Casual Four Piece Sectional Sofa w/ Full Sleeper and Drink Console by Lane at AHFA in the area. Product availability may vary. Contact us for the most current availability on this product. 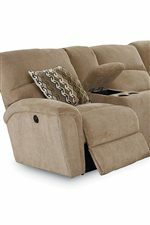 230-67 Grand Torino Left-Arm Facing Double Reclining Loveseat With Storage 1 0" 0" 0"